MIAMI, FL-Following a $41 million rehab, the Frank Gehry-designed former Centre Culturel Americain in Paris has reopened as the home of the Cinematheque Francaise. The cultural landmark's new permanent exhibition, Passion Cinema, with show control by Medialon Manager, traces the history of the collections of the Cinémathèque française and the Centre National de la Cinématographie which include films, objects, equipment, and costumes-some dating from cinema's earliest days. With show control by Medialon Manager, the exhibition Passion Cinema, at the Cin�math�que fran�aise in Paris traces the history of the collections of the Cin�math�que fran�aise and the Centre National de la Cin�matographie which include films, objects, equipment, and costumes-some dating from cinema's earliest days. Medialon Manger controls a Bull-IDTV video server feeding 26 GLIMM transparent screens and six LCD screens, and a smaller server dedicated to a Sonic Solutions spatialization sound system synchronized with three video projections on a holophonic wall. Manager also controls the interactive terminals throughout the exhibition as well as the extensive lighting complement that includes 400 LEDs plus gobos. Medialon Manager's most innovative application involves the use of the TCP MOD BUS protocol usually used in the automation industry to control processes at petrochemical and nuclear-power plants. All of the electrical power boxes at the Cinémathèque, which feature WAGO modules, are controlled by Manager in the timeline under TCP MOD BUS protocol with Ethernet relaying the commands between Manager and the electrical equipment boxes. The result is a very flexible and reliable control system. Medialon Manager's user-friendly operation was also an important consideration. 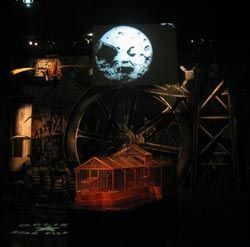 The Passion Cinema exhibition is entirely automated thanks to Manager's scheduler programming which turns on equipment at the dates and hours chosen by the Cinémathèque. Manager can also handle remote maintenance and updating of the exhibition's video contents and programming. A custom program by ADN-Systemes, which did the exhibition's AV engineering, enables the Manager operator to use a WIFI-connected laptop to fine tune a video projector's contrast or modify the display parameters. The Medialon installation was accomplished in a quick, four-month turnaround and represents a unique fusion of museum and industrial applications. Massimo Quendolo directed the Passion Cinema exhibition which features AV design by Jean-Christophe Desnoux and lighting design by Orphee Lumiere. ADN Systemes' head of project was Patrice Bersani with Benjamin Pitte project manager, Vincent Monnier programmer and Ludovic Utri handling the WAGO integration.